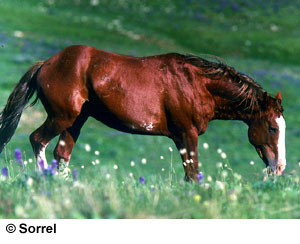 The Mustang is a feral horse found now in the western United States. The name Mustang comes from the Spanish word mesteño or monstenco meaning wild or stray. Originally these were Spanish horses or their descendants but over the years they became a mix of numerous breeds. These were the horses which changed the lives of the Native Americans living in or near the Great Plains. As European settlers came farther west they brought their horses with them. Some were lost to Indian raids, others were freed as wild stallions tore down fences to add the tame mares tn his herd or tame horse escaped from settlers as the original horses had escaped from the Spanish. 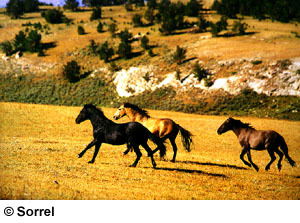 Draft breeding was among the horses which added to the Mustang herds. Also the Indians bartered and captured horses between tribes, making the distribution more complete. Another breed that probably contributed to the blood of the Mustang is the old-type East Friesian. For a period of over 10 years during the late 1800s and early 1900s about 150 stallions each year were purchased by the U.S. government from Germany. The old-style East Friesian of that time was a heavy warmblood or coach horse and was purchased to pull artillery or heavy wagons. So wherever the US calvary was found in battles in the west these horses were found, and undoubtedly some escaped and added their blood to that of the American Mustang. The large herds of wild horses did not pose a particular problem until the western United States became settled and cattle and other grazing animals were added to the native range. The arid lands of the west could not support a large population of grazing animals and on some ranches it became the policy to shoot Mustangs. The population of Mustangs at the beginning of the twentieth century is estimated at two million. By 1926 the population had been halved. The current population varies but is near 30,000. In 1971, Congress passed the Wild Free-Roaming Horse and Burro Act which protected these animals. The Department of the Interior, through the Bureau of Land Management (BLM) and the Department of Agriculture, through the Forest Service, have the responsibility of administering this law. Under this protection the population of wild horses quickly grew during the 1970s until control of their population became a major concern. Amendments in 1976 and 1978 to the original 1971 Act addressed the problem and need to dispose of the animals being removed. The agencies continued to work toward appropriate management levels and removal of excess animals was needed to reach those goals. This actions was taken to comply with the requirement that the Secretary of the Interior "shall immediately remove excess animals from the range so as to achieve appropriate management levels." The act directs the removal of all excess animals "to restore a thriving natural ecological balance to the range, and protect the range from the deterioration associated with over population." The Adopt-A-Horse program was begun in 1973 in the Pryor Mountains of Montana as a humane way to distribute the excess animals. Through this program excess animals are made available to the public at a cost of $125 for each horse and burro. Adopters must meet certain requirements for furnishing safe transportation and housing for the animal. The animals remain the property of the government for one year following the adoption. At the end of the year the adopter is asked to submit a statement from a veterinarian, extension agent, local humane official or other qualified individual certifying that the animal has had proper care. After approval a certificate of title is issued and the animal becomes the legal property of the adopter. These mustangs, while requiring experienced handlers, usually become as tractable as any horse raised from birth on a farm. Because they are largely the product of natural selection these animals are usually fine riding animals and exceptional in endurance trials. Most Mustangs are of the light horse or warmblood type. Horses of draft conformation are kept on separate ranges. 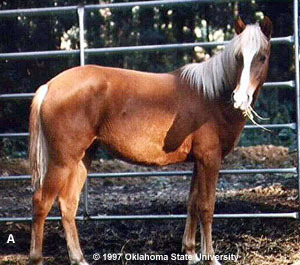 The coat color is the full range of colors found in horses. While the Spanish blood has been diluted, many of the horses still exhibit Spanish characteristics. 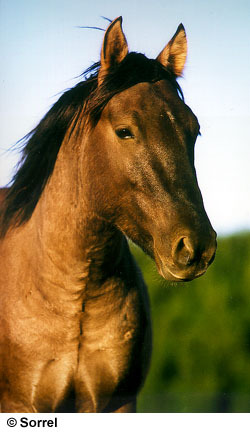 There has been a firmly held belief for several decades that there were no pure Spanish-type horse remaining on the ranges of the wild horse. But in recent years a few small herds have been found in very isolated areas which have been found through blood testing to be strongly decended from Spanish breeding. Among these are the Kiger and Cerat Mustangs. Elsa & Martin Wahl, Savannah, Ga (Photo A). Nyla's Gold at about 16 months. She is from Nevada Wild Horse Range 524, which is near Nellis Bombing Range in Southern Nevada.